You scream, I scream, We all love Ice-cream. Except my beloved husband. actually that's is the main reason, I love my husband so much. He doesn't eat all the delicious food, which I love the most. Like Ice-cream, kulfi, Fuchka,Ilish mach, Mutton, chingri mach, Lebu and many more. So all these delicacies are mine. Not even my son's, as he is not eligible for eating those items till now. So whenever I make Ice-cream or order for myself, I eat all of it. I insist him for some, but he takes only few spoons, and all are mine. Since few days I was craving for this Ice cream, but this flavor is not available out of West Bengal. So last Friday I made this delicacy, as nolen gur was at home, which my mom brought for me in last winter. Amul cream and nestle Condensed milk were also at home, I no sooner make it and freeze it for over night at lowest temperature. Next day, afternoon, after having some scrumptious lunch, I bring it out of the freezer and checked if it has frozen to ice cream or not. And it was. 4 scoops, took in a glass and take few snaps, but before taking nice one, ice cream started melting. Had little bit and again put back to freezer. Next day again took some scoops and before taking the best shot, it again started melting. But somehow melting ice cream snaps were taken. And I enjoyed the bowl. It was pure bliss, believe me. Just having a spoon with closed eyes. Just like dearm comes true. The soft fluffy melts in mouth with sweet earthy flavour of Nolen gur just like heavenly experience. Here is my only 3 ingredients 'Nolen Gurer Ice-cream' recipe....Just have a look. 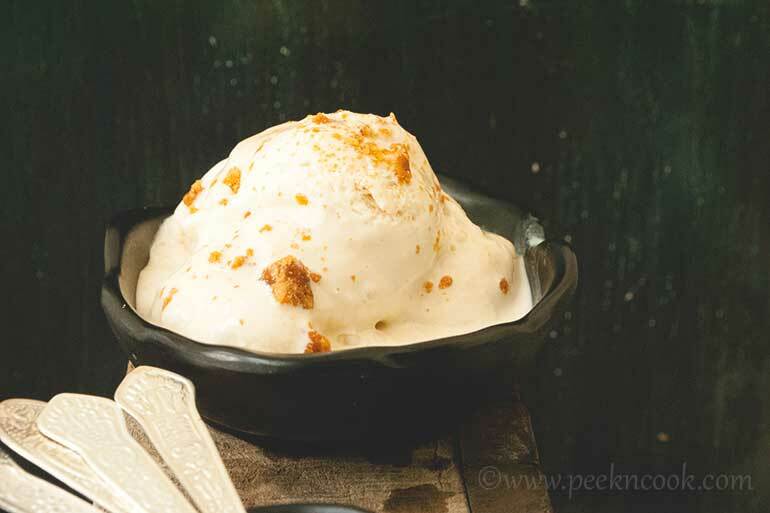 Nolen Gurer Ice Cream Recipe- Learn how to make Nolen Gurer Ice Cream step by step on PeekNCook. Find all ingredients and method to cook Nolen Gurer Ice Cream along with preparation & cooking time. Take a stainless steel bowl, and keep inside the refrigerator for 2 hours. In the meantime arrange everything, like a hand beater, condensed milk & Grated patali gur measured in cup, and a airtight container where you are going to set the ice-cream. After 2 hour bring the bowl out and the fresh cream too. Pour the cream into the bowl and beat it till the cream forms a firm peak. It will take 6 to 8 minutes. In between of beating grdually mix the grated Gur with the cream. After makeing a firm peak, add condensed milk to it and nicely fold them together. Don't do it fast, just fold to mix it using a spatulla. Then pour the mixture into the air tight container and freeze it for over night.